Happy Celiac Disease Awareness Month!!! But the road to full awareness stretches on ahead of us, and we must continue helping people with celiac disease to get properly diagnosed and get diagnosed earlier, so that other autoimmune diseases aren’t triggered and a host of other health problems don’t arise. I’ve never felt more passionate about this cause than now, because a dear friend of mine has five different autoimmune diseases, including celiac disease, and she nearly died this last week. Of course, celiac disease awareness is important every month, but I’m going to try a little harder to spread the word about it this month. Will you join me? 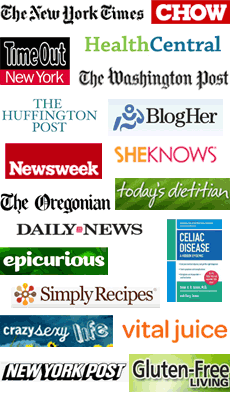 I’m excited to have the opportunity to write several articles about celiac disease and the gluten-free diet for some major websites this month. Thousands will be reached with accurate information. I’ll let you know when they are published. 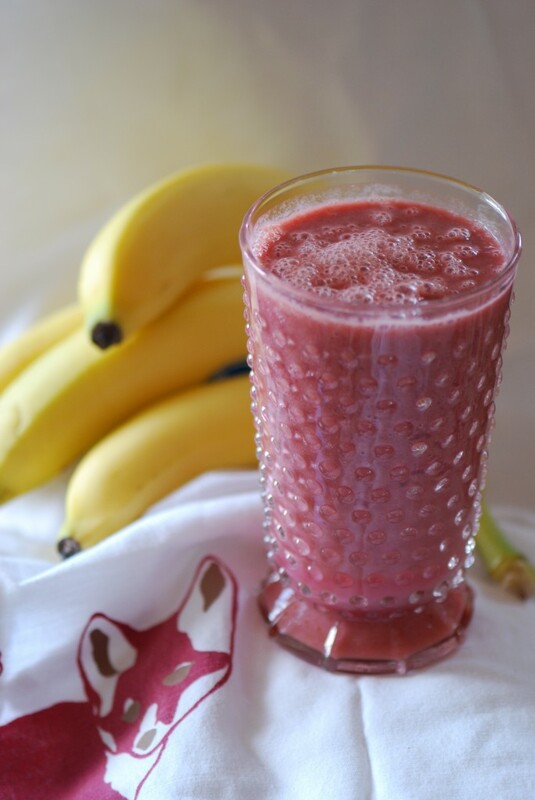 Now let’s “celebrate” awareness with an anti-inflammatory smoothie! You may or may not be familiar with the term “anti-inflammatory”. In case you aren’t, here’s a good description from Dr. Andrew Weil’s website. As it turns out, we know that chronic inflammation is the root of disease. So, the more anti-inflammatory foods you can eat, the better. These are foods that are known to help combat inflammation in the body. I have a strong hunch that a gluten-free diet high in anti-inflammatory foods must be very healing, soothing to tummies that have been inflamed for a long time. I “cured” my seasonal hayfever allergies last year by drinking one of these anti-inflammatory smoothies every day. I used to be a serious Zyrtec junkie, so you can imagine how amazed I was the day I walked outside to find my car all yellow, dusted in pollen, and I wasn’t sneezing my head off. Yup. All because of my new anti-inflammatory smoothie. Well, how do I know this? While at school, I listened to a 3 hour lecture by Dr. Douillard, where he explained how to combat seasonal allergies by eliminating inflammatory foods (refined sugars and flours, processed foods) and consuming more anti-inflammatory foods (berries, especially raspberry and blueberry, and green vegetables) in the Springtime. I didn’t really think it would work, but I thought it would be easy to try. Plus, I had already eliminated inflammatory foods like gluten, refined sugars and flours, along with my additional food intolerances of dairy and corn. Maybe I just needed to up the berries and greens? I just decided to create a smoothie with both berries and frozen greens. I call this my “Sneaky Smoothie”. Put all of the ingredients in the blender. 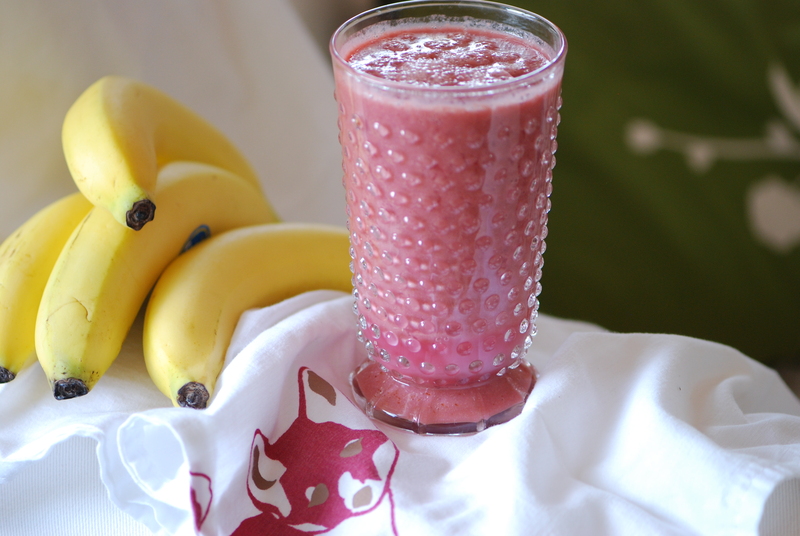 Add enough water to meet your ideal smoothie thickness. Blend. If you need to sweeten it a bit, add a bit of honey. You can play with the amounts…if you need to, ease into it by adding less greens at first. Be sure to come back and tell me how you liked it! My allergies have been AWFUL and so I decided to give this a try. Drinking it now, hopefully will help! Thanks for the tip! Another Kelly?! 🙂 And I see you spelled it the right way! Be sure to cut out refined sugar, and refined white flours while you’re at it. Last year when I binged on some sugary gf cake my nose started running and it took a few days back sugar-free again for things to calm down. It really is the combo of removing all inflammatory foods along with upping the berries and greens. Also, try to eat some extra green veggies at each meal too. And stick with it for a good week or so. Thank you for this info and the recipe. I will do my best to continue to spread the word. Please let us know how you friend is doing in the coming weeks. There is something seriously wrong with my vegetarian, gluten-free taste buds, because I’ve never been able to get into avocados and I straight-up HATE bananas. Smoothie recipes always seem to call for one or the other, so I’ll just have to get my anti-inflammatories some other way. Awesome, thanks for the tip! Maybe an apple would work, too—someone else suggested that to me today. Thanks for this idea of an apple! I’m strangely allergic to bananas too! Makes it hard. PS…Mango is nice in a smoothie too! It’s creamy. Really good photo! Very tasty! YUM 🙂 Like it! Thanks Kelly for the info. I luckily do not have allergies – but my husband does. Will have to try it!!! I can’t wait to try this. I am recently GF and on a Food Sensitivity Elimination Diet. Would it be possible to include some Pea Protein Powder and call this a meal? This is really great, tried it with organic peas and berries and since organic peas are so sweet did not need any sweetener. This is also great after I work out as a protein pick me up with some organic hemp added. Do you have other suggestions and/or recipes to help reduce infalmmation? I have a terrible sweet tooth, so it has been hard keeping down the sugar 🙁 I have been struggling with swelling in my hands & joints for 8 years. Neg for RA. Rheumatologist said it is due to celiac. Told me to take ibuprophen 2-3 times a day. I fear for my stomach & blood vessels. I am only 34 & very frustrated. I also find I swell without eating sugar, or eat some sugar & don’t swell. Sorry, but seems like I keep going in circles. There is a lot of great articles here. If you are really serious about feeling better try some of these suggestions. Plants are some of the best anti-inflammatory food there are along with nuts like walnuts. Sweets can still be ok but in moderation and not SUGAR. Good luck! We have come a long way since I went GF 17 years ago, so many more choices in GF foods. I’ve been doing more smoothies lately and now that it’s summer in MI I’m definitely warming up my blender, I’ll throw in some spinach next time and see how I like it! Mine def did not look like this, I too love the glass, also was I not suppose to put ice in it?? I have used curly kale and although strong, tasted great. Cannot eat banana either (or sores..no idea why they affect me so much) so used a raw carrot as this sweetened it up a bit. Great recipe with sooooo many benefits.